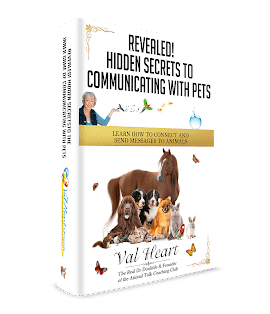 Val Heart is internationally recognized and is called Animal Communicator to the Stars. She is known as The Real Dr Dolittle and is an expert animal whisperer. She’s the Founder of The Heart System™ – a 5 step program for solving problems with animals. A professional horse whisperer and mentor for show riders, Val is known as Equine Peak Performance and Problem Solving Specialist and is often called the Show Horse Rider’s Secret to Getting Into the Winner’s Circle! I am excited you are here because together we can improve your relationship with your Show Horse to reach amazing new heights by clearing the rubble in your relationship, improving your ability to communicate with each other, and getting you on track with your equine athlete to get you where you really want to go. I created my unique 5 Step Equine Peak Performance System™ for one reason: to help YOU succeed in whatever showing category you are competing in. I first fell in love with horses when I was five. My first job when I was only twelve years old was as the horse counselor for a summer day camp in Austin, Texas. I managed thoroughbreds, quarter horses and ponies, taught riding lessons for the campers, and even trained a spoiled five year old pony mare for the campers to ride. I have a special affinity with every horse I have ever met. Over the years of working with show horses and jumpers, I noticed that people were missing important information their horses were telling them. Time and again, I saw their owners get frustrated, depressed, trying all sorts of different tools, trainers and techniques, with little success. Often, a more forceful approach only caused their horses to do the exact opposite of what they really wanted them to do. I never understood why they simply didn’t ask the horses what was wrong first before they spent so much energy, time and effort chasing their tails on expensive guesswork! One day, I had the opportunity to work with a world-class Grand Prix dressage rider who was making mistakes in the show ring for a pre-Olympic trial. He couldn’t figure out what was wrong. In practice, his horse would perform beautifully, but as soon as they got in the ring, he would falter. After a fifteen-minute conversation with his horse, we uncovered what was wrong, and fixed it. They went out and won their competition. Over the years, many stories like these have helped me formulate my proven 5-Step Program, “The Equine Peak Performance System™.” My system gets you where you want to go – FAST!